Whether you are looking to replace QuickBooks with a more powerful accounting system or you are looking for a robust cloud solution that can run your growing business, you first need to determine what you really need in an ERP system before you start the selection process. 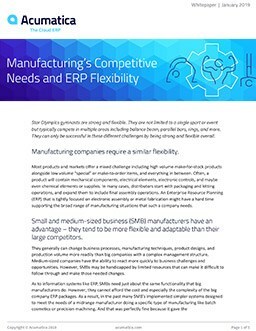 While all ERP systems have to perform the same basic accounting and business management functions to keep your books and run your business, if you look under the hood, you will realize they are not all the same. So, where do you start? And how do you choose? To help you, we’ve prepared a series of comparisons between Acumatica and our major competitors, showing you where we are the same and where we differ. We also provide you with questions to ask your leadership team and your ERP vendor along with a checklist you can follow when determining the right ERP system for your business. Acumatica is an integrated financial, CRM, and business management solution that helps you run your business more effectively. We believe Acumatica provides the best price/value, performance, functionality, and ease of use of any ERP system available for small- and medium-sized businesses. All of the competitors listed here make a viable ERP product, we are not saying they don’t. But think we’re better, and we want you to know why. Looking to purchase or upgrade an Accounting, Business Management, or ERP System? This guide walks through the questions to answer before you start your search, along with a checklist to ensure you select the system that is right for your company, from productivity features to the latest technology. Ultimately, the decision of which ERP system you choose is yours. The only thing we ask is that you perform due diligence, ask questions, and know your requirements. We want you to get the ERP system that is right for you – whether or not you choose Acumatica. There is one thing we can say about our competitors: All the products listed here will charge you for every user you add to their system. Acumatica does not. Period. In the 5 Step Guide you will learn from experts how a successful ERP selection and implementation is planned, organized, and executed. It contains real-world advice on how to navigate this process and avoid common pitfalls.